Do you feel called to pray specifically and regularly for RRT? Get prayer requests in your inbox. Eastern Nebraska flooding deployment: Crisis-trained chaplains with the Billy Graham Rapid Response Team (RRT) are on-site in Dodge County, Nebraska, one of many areas across the Midwest that has been inundated with a historic level of flooding. Please pray for those suffering the effects of these floodwaters, including those grieving the loss of loved ones. Ask God to meet every need. Billy Graham burial site ministry of presence: Rapid Response Team (RRT) chaplains continue to offer a ministry of presence at his gravesite on the grounds of the Billy Graham Library in Charlotte, North Carolina. Recognizing this is a memorial site where people come to pay their respects and mourn Mr. Graham’s passing, RRT chaplains are there to listen and pray for the individual needs of those who stop by. Thank you for praying for this outreach effort. 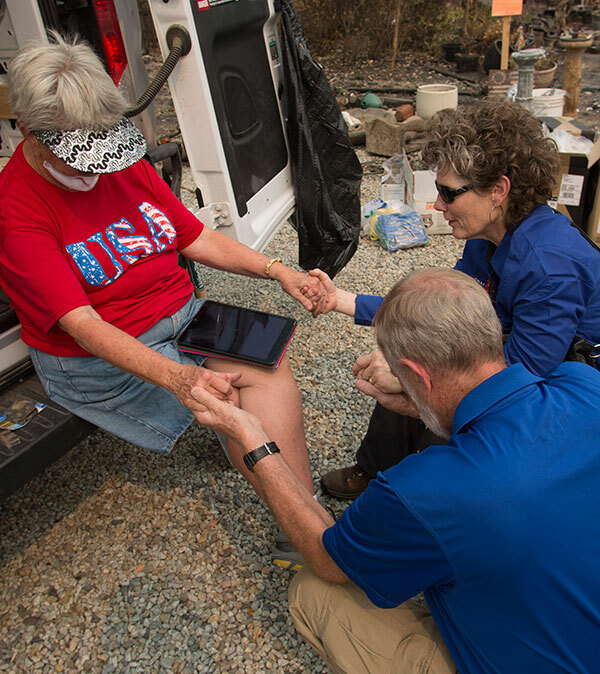 Rockport/Pearland, Texas, rebuild ministry: RRT chaplains are working alongside Samaritan’s Purse (SP) rebuild teams in Rockport and Pearland, Texas, offering a ministry of presence to homeowners and SP volunteers and staff. Please pray for homeowners, asking God to minister to them as they wait for the completion of their homes. Ask God to protect all on the worksites. Lift up RRT chaplains as they offer help and support to this vital ministry. Hurricane Michael: Pray for those in the Southeast who continue to suffer the effects of Hurricane Michael. Ask God to comfort those who are grieving and pray for physical, emotional and spiritual needs to be met. Pray for RRT chaplains as they offer help and support through the love of Christ to those in Panama City, Florida. Preemptive prayers relating to man-made disasters: Please pray for God’s love and truth to penetrate the minds and hearts of those who may be considering creating havoc that would result in injury to themselves and/or others. Invite God’s powerful presence to draw people to Himself that they might know life in the fullest measure through Christ. Preemptive prayers relating to natural disasters: Ask the Lord to stabilize the weather patterns and keep extreme weather conditions at bay. Since Jesus Himself said, “Peace! Be still!” (Mark 4:39) to the storm, pray for accommodating weather. Thank Him for taking care of our every need. Recent disasters: Lift up those affected by man-made and natural disasters in recent weeks and months. Ask God to comfort and encourage those enduring emotional and physical stress. Pray for His work to be accomplished in individual lives as He tenderly cares for them.